Free2WinGames.com: Poppit! - Popular for a reason! Poppit! - Popular for a reason! Your goal is to "free" all of the prizes inside the balloons. This is trickier than it sounds! Unlike Diamonds or Merry Poppings, you don't switch balloons around to make matches. Instead you look for two (or more) balloons that are the same color AND are either in the same column or row. When you click on a match the balloons will vanish, and the balloons below will float up! No new balloons will replace them. The prizes are stuck to the sky, so they don't move with the balloons. A prize is "free" when there isn't a balloon on it anymore. On level 1 difficulty most of the prizes are in the middle, so it's easier to complete the game. In levels 2 and 3, more prizes are near the top of the board. It's a lot harder to win on 2 and 3, but you get more tokens for your effort! After you free the prizes, you should keep playing to clear as many balloons as possible. There's a BIG bonus if you leave 5 or less balloons on the board! Pop 8+ balloons in one go and you'll get a Super Pop! In addition to looking cool, making a Super Pop also earns tokens! A powerup looks like a star inside a balloon. Powerups are VERY rare and there are only two kinds. You can't tell what you'll get until it falls! Pin - Pops one balloon. You pick which one! Weight - Moves one column of balloons down one space. 2. Work from the bottom up. Specifically you want to look for horizontal matches. Three balloons from school are we! If you aren't careful you'll lose horizontal matches when balloons float up. Keep an eye on them! Now, vertical matches you don't have to worry about. Aww. They need smiley faces. Since the balloons float up and not across, you will never lose a vertical match. Use them to match with singles, or connect other balloons for a Super Pop! 3. Remember that there is NO timer. You can leave Poppit! open and come back to it later! 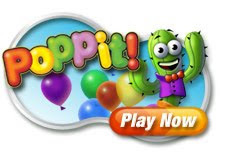 If you're already a fan of Poppit!, you might like some of these games too! Merry Poppings at Slingo - It's a longer game with a lot of challenges! MegaSpheres at BugleGames - New marbles fall to the *side* instead of up! Collapse at iWon - You have to be fast with this one!